Every quarter-aged hipster wants to be a DJ at one point or another. The only problem is that DJing is actually a really expensive hobby, if you do it right. (And by right, I mean legally.) It used to be that you needed turntables, a mixer, an audio interface, crates of records, a controller and at least one sweet-looking set of headphones. That was then. This is now. Now, simple, free music apps like Spotify, iTunes and Google Play make it relatively easy to create smooth transitions with nothing but a laptop and, ideally, an iPad or two. While that hardware's not cheap, it's likely that you own at least one if not more already. And the deeper features and emerging culture of social music sites like these even help up-and-coming artists play tribute to the legends in increasingly silly and Internet-y ways. Imagine Spotify is one big band practice, where you have different collaborators throwing songs into the mix. So-and-so brings in the thump-heavy track to serve as a foundation for a mixtape, the kind a DJ from the olden days might've tried to sneak into a Hollywood studio. Another introduces a horns-heavy follow up track. Some lead singer character pulls out that sick hip hop track from last year, while his friend supplies a vocal track. These tracks can also be samples, since Spotify effortlessly finds the music on your hard drive. Broadcasting with Spotify and crate-digging with iTunes (and vice versa) is also a ton of fun. I found out about these features having spent the last week laid up in bed with what's politely known as Montezuma's Revenge with nothing but a MacBook Pro equipped but Spotify and iTunes and a desire to spin. And guess what: it was awesome. The premium version of Spotify is be far my favorite daily music app. And given the involvement of Sean Parker (a.k.a. Napster) in bringing it to the United States, it's not surprising that Spotify is a real music nerd's utopia, especially if you like bands on the major U.S. labels. Yes, lots of music is missing due to licensing issues. You might get a little frustrated to find that some songs aren't available in your home country, though there are things like VPNs to work around that issue if you really want to. On a daily basis, though, I find that most of the daft pop that I like to tap my foot to on the subway is there. If you want to be a fake bedroom DJ, your best friend should be the queue feature. Like the expensive DJ apps, this is where you can line up songs on the ones and twos, though Spotify actually makes it even better be enabling you to set up entire playlists on the fly that you can both share and stream as a radio station. This basically enables you to make playlists on the fly that can keep your set sounding pretty smoothless. Know two other wannabe DJs? Set up a collaborative playlist, tell them to sign on and you can all add to the same queue, switch around the tracks, set up and stream their tracks. Similarly, if you're DJing a party, you can just keep an eye on the social stream to the right for requests. Friends can also send songs straight to you using the share feature. Also super cool: The ability to stream a playlist as a radio station so that you can send the link to your friends and let them customize it and send it back. Things get really fun when you start integrating Spotify's mobile app into the mix. This sort of eliminates the need for a second turntable channel since you can just preview what's next from your pocket. Ever heard of silent dance parties? Spotify is amazing for silent dance parties. An even more seamless way of doing this is to run iTunes and Spotify in tandem. This sounds pretty ramshackle, because it is. 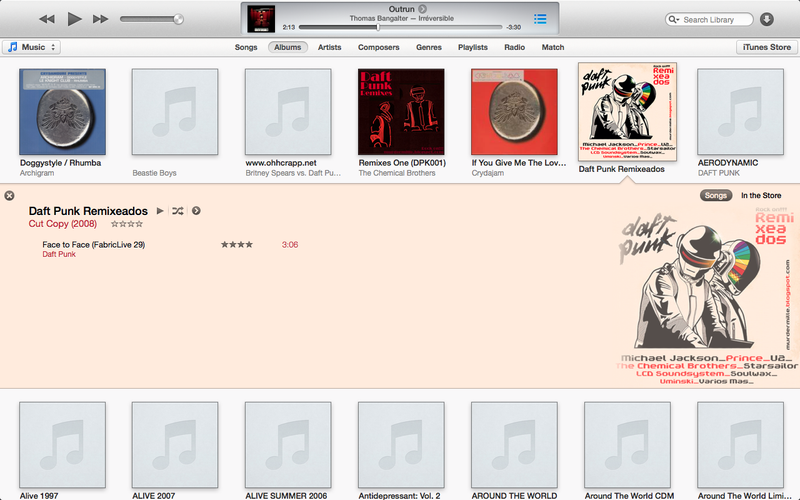 However, the iTunes has improved a ton since the last time you bothered opening it. It also has the queue feature, as well as a "Play Next" option that will basically make a song of your choosing buck the line. You can fiddle with the transitions in iTunes Preferences to make one song flow smoothly into the next. As always, the ability to rate songs from one to five stars is a great way to organize your collection, one that's a step up for Spotify's binary starring method. The iTunes Match service makes it possible to share a collection with a few people, but it's nowhere near as easy as Spotify's all-your-friends-all-the-time approach. Apple also makes you pay for your music. You do get a better selection and more goodies for the ten or so dollars an album. During my latest pretend DJ phase, I couldn't get the new Daft Punk album on Spotify, so I bought it. It was my first iTunes Music purchase (no kidding) and it came with a neat jacket design that's quite obviously inspired by Michael Jackson's original release of Thriller. I, feeling feverish, decided to start buying more tracks: old Thomas Bangalter james, more Daft Punk remixes and classic Moroder albums like the soundtrack of The Neverending Story. By switching back and forth between iTunes and Spotify, using nothing but the volume slides as a fader, I started to put together mix tapes. With my Sony Studio Monitor headphones, I lost myself to—well—dance. It was the only thing that made me feel better. The streaming music space is becoming incredibly competitive. No doubt, record companies are letting folks like Spotify and Apple battle it out for some of the best stuff. For instance when I hit a wall trying to blend the Drive soundtrack into all of these Italo-French disco house, I did something I never thought I'd do: I bought the album on Google Play. This interface didn't make as much immediate sense to me as the others, a common conundrum when it comes to Google products, I find. Buying was a breeze, though. Then again, Google's always been good at taking people's money. But the synergy between Spotify and iTunes is undeniable. Of course, this only get's slicker and sleeker when you integrate tablets into the mix, though Spotify's iPhone-only app isn't all that helpful for this kind of thing. You can still pay lots of money to download real DJ software, too—Traktor Pro has always been my favorite.